Washington – Opening salvos were fired Monday in the antitrust case against the proposed merger of Aetna and Humana, with Justice Department attorneys arguing the tie-up would mean sharp price hikes for Medicare Advantage plans and a disintegration of choice for people purchasing insurance on Affordable Care Act exchanges. Attorneys for the insurers vigorously disputed that their $37 billion marriage would reduce competition in a growing Medicare Advantage market or on the ACA exchanges and promised their witnesses, including Aetna CEO Mark Bertolini, Humana CEO Bruce Broussard and a slew of antitrust economists, would prove it. On Monday the Justice Department introduced witnesses who tried to knock down the insurers’ main argument – that traditional Medicare would continue to provide competition and choice for America’s seniors. Justice Department attorney Craig Conrath argued the merger between Humana, the largest seller of Medicare Advantage policies, and Aetna, the fourth-largest. would result in a monopoly in 70 counties in the United States and limited choice in hundreds of others. He said competition between Aetna and Humana has been “critically important” in the Medicare Advantage market. Aetna attorney John Majoras said there is vigorous competition for the 10,000 Baby Boomers who become eligible for Medicare each day. But Justice Department witnesses said consolidation among insurers already has pushed up the premiums of Medicare Advantage plans. Those plans cover doctors and hospital visits, like traditional Medicare, but usually limit patients to a network of doctors and hospitals. Traditional Medicare gives patients an unlimited choice of providers. But Medicare Advantage plans cap out-of-pocket costs at $6,700 a year or less for a policyholder and can provide more generous prescription drug coverage than Medicare. In this first week of the trial, the focus is expected to be on the relationship of Medicare and Medicare Advantage.About two-thirds of those eligible choose traditional Medicare coverage and one-third choose Medicare Advantage plans. Majoras said Aetna sought a merger with Humana to diversify its insurance offerings. Aetna says only 3 percent of it’s market is Medicare Advantage, with large group coverage representing the bulk of the insurance it sells. “The combined company is going to be a more balanced company,” he said. Judge John Bates is hearing the case in federal court in Washington, D.C., the same court that is considering a separate Justice Department suit to block a merger between Anthem and Cigna. 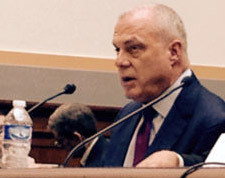 Aetna CEO Bertolini is expected to take the witness stand late this week or early next week. Eight states and the District of Columbia have joined the DOJ’s Aetna-Humana lawsuit. Connecticut joined the lawsuit against the Anthem-Cigna merger, but state Attorney General George Jepsen said Louisville, Ky.-based Humana does not have a large enough “footprint” in the state to warrant opposing a merger with Aetna. There may be a local impact if Bates allows the merger to go through, however. Bertolini has not committed to keeping Aetna’s headquarters in Connecticut if it pairs up with Humana. Conrath said Molina had only 424 Medicare Advantage customers. “Molina is just not going to have the ability to replace the lost competition,” he said. The DOJ also said the merger would hurt competition in the Affordable Care Act’s state marketplaces. He played a recording of President Obama saying the exchanges were attracting sicker, older customers, and said insurers are never able to assess their risk in this pool, which has high turnover. “Aetna was far and away the best company,” he said. “The AMA stands by the conclusion that Medicare Advantage is a distinct product market where competition is important, and Aetna’s argument to the contrary – that it competes with the federal government offering traditional Medicare – is a flawed defense of a highly anti-competitive merger,” said AMA President Andrew Gurman.